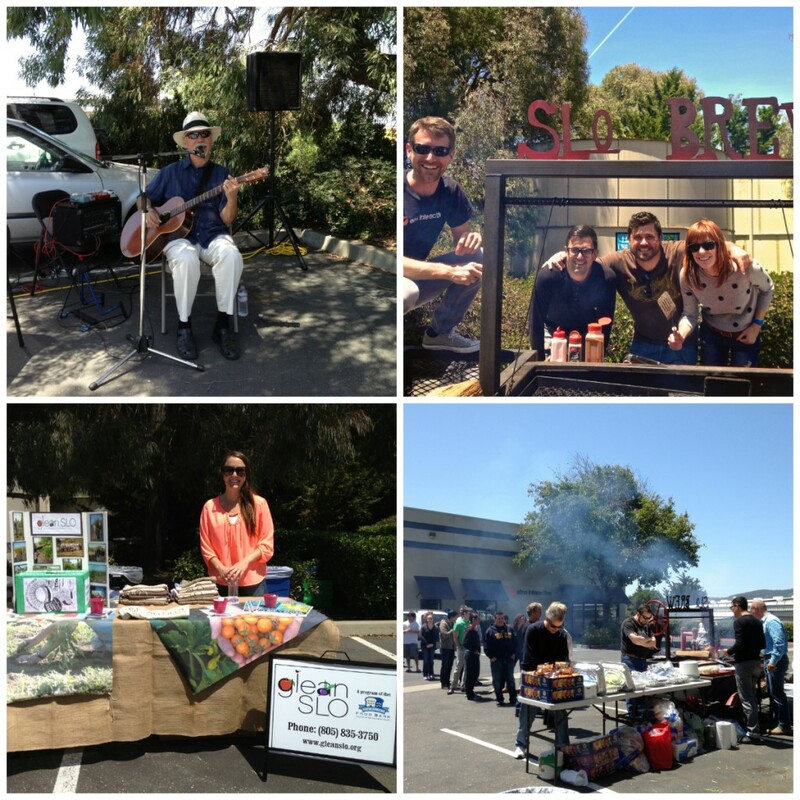 Thank you to Etna Interactive for hosting the Hunger Awareness Day barbecue to raise funds for the Food Bank and GleanSLO! Musician Louie Ortega entertained the crowd, SLO Brew shared their barbecue, Ryan Miller (Etna Interactive President) helped cook the burgers, and Bunryon Brothers Tree Service donated the oak wood. The Etna Interactive’s Community Action Committee made up of Jimmy apRoberts, Colby Courter, Jenna Mitchell, Coral Bowers, and Michelle O’hara, planned this awesome event for their employees and invited neighboring businesses. Thank you to all who were involved and donated $850! This entry was posted in Donations!, Events on 05/29/2013 by gleanslo. 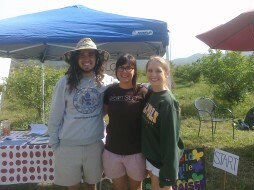 We couldn’t do what we do at GleanSLO without all the people who support us. Last month in our newsletter we featured volunteers Marv and Pet Daniels. This month we feature Food Bank Board Member and GleanSLO Steering Committee Member, Stephanie Teaford. Stephanie works for STRIDE at Cal Poly as Community Liaison. Please read below to learn more about Stephanie! GleanSLO: Can you tell us about your background with GleanSLO? Stephanie: I’ve been privileged to be a part of the GleanSLO team since the start. We spent those early years relationship-building with those interested in figuring out how to use what otherwise would be wasted to feed our community. We got to know each other and learned how we could work together for a common goal. Stephanie: I like being out in natural settings – the trees, plants, animals, insects (I have seen one’s I’ve never seen before! ), visiting with fellow gleaners, and feeling like I’m making a difference in the lives of others. GleanSLO: What would you tell a homeowner or farmer who has too much food, doesn’t know what to do with it, but might be hesitant to contact GleanSLO? Stephanie: GleanSLO is a very conscientious organization. The homeowner/farmer and their experience is of the utmost importance to GleanSLO. Without the generosity of those that have extra, there would be no GleanSLO and so making a homeowner/farmer comfortable comes first. We are in partnership and the glean only happens just as the homeowner/farmer wants it. We have a great system set up, facilitating people doing good for each other. GleanSLO: Anything else you’d like to share about your experiences with GleanSLO? 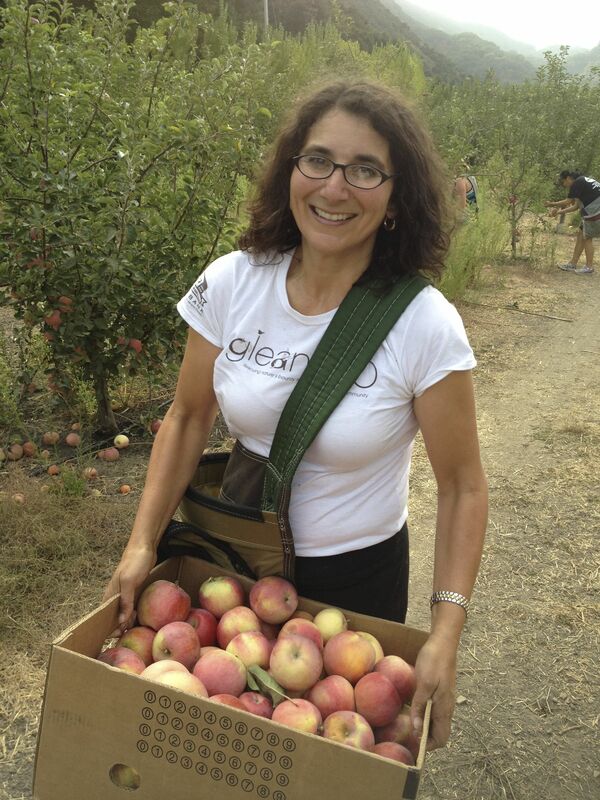 Stephanie: Gleaning makes so much sense for so many reasons and GleanSLO accomplishes so much. From providing food to building community, this grassroots effort is something everyone can feel good about supporting. I hope those to whom this effort speaks to will get involved and contribute – there are many ways to be a part of this amazing team! GleanSLO: Thank you, Stephanie, for all your work helping create GleanSLO and for all you’ve given to your community! This entry was posted in GleanSLO Interviews on 05/25/2013 by gleanslo. Thanks to two volunteer gleaners for offering blog posts today, Paula Lorenz and Nell Wade! I recently moved to the Central Coast from Wisconsin. I had been very involved in the local food scene: volunteering at the farmers’ market, helping to get a program to use food stamps at the farmers’ market going, running another program to get customers more connected to their food and the people who produced it. I had heard of gleaning by way of a French movie that I still haven’t seen, but knew of no such organization until moving here. I found the announcement to glean hydroponic lettuce on Friday, May 10th on Facebook and went to sign up. This is my third experience gleaning and my first opportunity to see working hydroponic systems. What an impressive space! 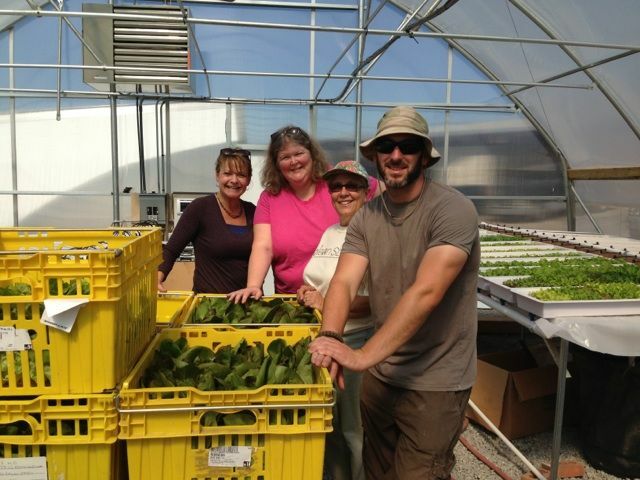 Four volunteers plus a member of the farm staff had the 300+ heads of lettuce (125 pounds!) cut and packed in about 30 minutes. It feels wonderful to be able to help provide fresh, healthy food to people who might not have it otherwise. It’s an amazing opportunity to go to the farms and explore parts of the Central Coast I might not ever get to see. And I’ve met, and worked with, the nicest people. 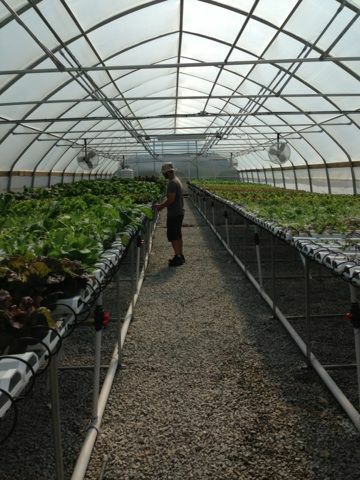 It was a beautiful morning (albeit a bit toasty) inside the hydroponic greenhouse of PepperCreek Family Farm. We had the opportunity to glean information about farming hydroponically as well as gleaning perfect heads of lettuce – without a trace of insect damage. The process was quite different harvesting here rather than in a conventional field row. One long plastic tube houses more than a dozen plants. No soil anchors their roots and they are watered and fed continuously via a small tube from one end. The solution exits the other end of the tube and is recirculated again and again. For harvesting, this tube is put on saw horses making it easier to cut the lettuce heads off at the base. No mess, no mud, no damage! Pictured below: Kelly Munoz, Paula Lorenz, Nell Wade and Eric Boyd from PepperCreek Family Farm. This entry was posted in Farm Harvests on 05/14/2013 by gleanslo. Thank you to SLO Creek Farms for asking us to join in their 3rd Annual Apple Blossom Festival this past weekend. The Gable family has been so generous to the Food Bank, gifting us tens of thousands of pounds of apples over the past three years. We were happy to participate as they welcomed the community to their farm for a free spring celebration. We welcomed people to a One-Mile Walk Fundraiser in the apple orchard and we raised over $200. Thank you to each and every community member who supported us, and every volunteer who joined in the fun. This entry was posted in Events on 05/09/2013 by gleanslo. Pictured below are superstar gleaners, amazing volunteers and wonderful community members, Marv and Pet Daniels. Marv and Pet have been gleaning with us since we started, are members of the wonderful organization, the California Rare Fruit Growers (CRFG), and participate in all kinds of volunteer events around the county. Read below to find out more about Marv and Pet. Marv/Pet: The thought that we are saving food that might have been wasted and this saving could enable folks to eat better. And through gleaning, people might have access to the wonderful fresh produce we are gleaning. GleanSLO: What would you tell a homeowner or farmer who has too much food, doesn’t know what to do with it but might be hesitant to contact GleanSLO. Marv/Pet: They are not only helping the community, but may be able to use a tax deduction. Marv/Pet: The folks that work with us are really nice sharing people who want to help others. They listen carefully to the picking instructions and are considerate of the growers requests for caring for their property, such as how much to pick and what not to pick. GleanSLO: Thank you SO MUCH, Marv and Pet, for the amazing number of hours you have contributed to our program, for the friends that you recruit and bring along with you, and for sharing your knowledge and enthusiasm with us! This entry was posted in Farm Harvests on 05/03/2013 by gleanslo.